If your watching the football and the ref is getting you heated, they you need a cooling handheld battery operated fan and we have just the thing for if you are getting hot and bothered. This fantastic St Georges Cross England Battery Operated Fan is a fan-shaped like an England fan! Not just a fun novelty product, but fully working and designed to give you a giggle while cooling you down. The England fan is wearing an England football shirt and waving the St Georges Cross, his head is the actual fan and he’s wearing an England baseball cap. It comes supplied with two AA Batteries and is ready when you are. Small enough to keep in your jacket pocket, bag or car glove box for instant cooling. For serious supporters we have England Football Supporters Mega Packs full of everything a serious supporter will need. If you really want to make some noise while showing your support, try the England Clapper Hand Shaped Noise Makers. Perfect for England fans young and old, the noise makers are shaped like hands and are decorated with the St Georges cross with the words “Come on England” on the front. When you wave them around the plastic hands clap together making plenty of noise, great if you have cheered and shouted so much you are losing your voice! Don’t be left in the dark, ensure you can be seen with the brightest England flags around! Our Light Up England Flags have the St Georges cross fixed onto a light up pole, the pole contains 5 lights with 3 multiple sequences and functions, great for waving at matches. Paint your face with our packs of England Face Paints containing 5 face painting crayons, 3 white and two red to ensure you have plenty for the perfect St George Cross every time! To really complete the look add colour to your hair with our special value twin pack 2 x ColourFX Coloured Hair Gels RADICAL RED & WICKED WHITE. Add attitude to your hair and take colour to the limit! If you prefer hairspray to gel we have that too, see our England St George Special Value ColourFX Coloured hairspray Radical RED & Wicked WHITE. Now you are ready for the match you just need your essential England Flag, our oversized England Flag has metal grommets so rope can be threaded through easily. New for 2010 are fantastic England 2010 World Cup football GoGo’s. Available in foil packs of 2 larger than normal football character GoGo’s for £1.50 a pack, and also in bulk buy boxes of 30 foil packs saving you money. 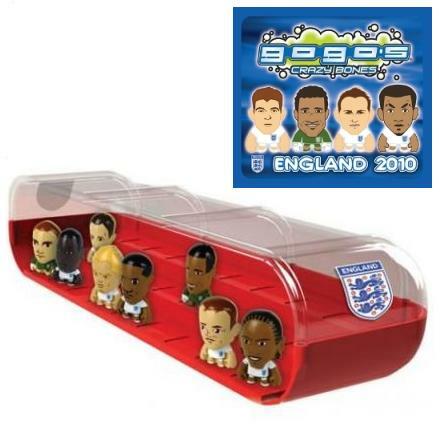 There are 27 different England 2010 GoGo’s to collect, including 5 harder to find laser versions all based on our proposed England 2010 World Cup team mates. 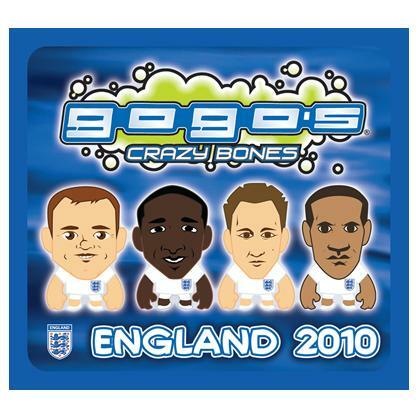 Complete your collection of England 2010 GoGo’s Crazy Bones with an official England 2010 Dugout which is jutst £4.95. Designed to take all 27 England 2010 GoGo’s, and a real must for any football or GoGo Crazy Bones fan.